A spectacular effort, this is a profound Pichon Baron and clearly my favorite vintage of this wine since the 1989 and 1990. An inky purple color offers up notes of barbecue spices intermixed with new saddle leather, creme de cassis, melted licorice, creosote, and a hint of vanilla. The wine is full-bodied, tremendously concentrated, with sweet tannin and a seamless finish that goes on for close to one minute. This wine has great purity, tremendous texture, and fabulous upside potential. This is a prodigious 2000! Anticipated maturity: 2008-2028. A fine effort, the perfumed, opaque purple-colored 2000 exhibits classy, complex aromas of incense, black fruits, vanillin, and spice box with a touch of charcoal in the background. On the attack, this full-bodied, impeccably balanced wine is powerful and sweet, with high levels of glycerin, superb concentration, beautifully integrated acidity and tannin, and a spectacularly long, layered finish. It is a profound effort from this second-growth Pauillac. Anticipated maturity: 2005-2030. 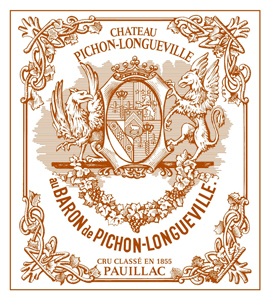 The 2000 Château Pichon Baron is just getting better and better and better. Perhaps the magnum format played its part, but nevertheless...just...wow. This is a millennial Left Bank with the keys to the top drawer. It has an incredibly precise, mineral-driven bouquet with intense black fruit infused with cedar and graphite scents. It just reeks of Pauillac in an almost uncompromising, yet compelling manner. The palate is structured, stylish and effortless, extraordinarily pure and unerringly youthful. This is a Pichon Baron saying, "You ain't seen nothing yet." You could broach this now if you wanted, but the clever people will wisely bunker this for another decade and gloat from 2025 onward. Drink: 2025 - 2050. Blackish crimson. Scented nose. Thick, rich, nervy, and really tense! Well done. Lots going on there. Reverberates. Date tasted 20th Jan 05.